•October 1, 2012 - I will not Bully, Inc. National Bullying-Prevention Month Public Participation Hand Print Pledge & fundraiser from 3-6pm. Lend your hand to this creative artistic community art project, eat delicious ice cream, and pickup prevention information. •October 6, 2012 - I will not Bully, Inc. & Scooptacular Ice Cream National Bullying-Prevention Month Public Participation Hand Print Pledge & fundraiser from 12-2pm. Lend your hand to this creative artistic community art project, eat delicious ice cream, and pickup prevention information. Plus: All children can participate in the Public Hand Print Pledge that will be showcased in the library for National Bullying-Prevention Month. The event will be held at Ceasar Chavez Library on 35th ave. & Baseline from 1-3pm. All ages welcomed; open to the public. •November 21, 2012 - I will not Bully Inc. at Skateland in Mesa, Arizona for a community event and awareness rally. 5pm - 8pm. & Vigil in Remembrance of Newtown. 11a.m. - 3p.m. •February 2013 - I will not Bully Inc. is holding an audition for a commercial PSA. This audition is for all ages. We're looking for a wide range of models from youth to senior models. Email info@iwillnotbully.org for more information. •February 15, 2013 - AALLCAZ Summit at the Arizona State Capitol focusing on youth, environment, education, health and justice. •March 23, 2013, 5-7p.m. 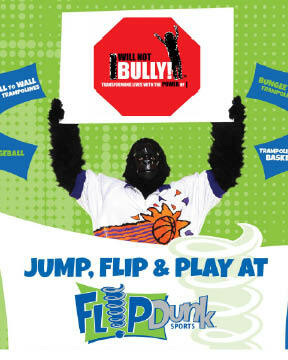 - Bounce for Bullying-Prevention at Flip Dunk, the 19,000 sq.ft. indoor trampoline park for a little high-flying fun! - Created by the Phoenix Suns Gorilla, Flip Dunk is Arizona's only recreational park and dance center offering a one-of-a kind experience with trampolines on the floors, walls - bungee trampolines as well as tumble tracks with basketball hoops for a slam dunk finish. Register your group, school or bring out the entire family! It's going to be fun! •February 5, 2014 @ 7PM - TAKE A STAND. LEND A HAND! Dobson High School Dance Company is proud to present the 10th Annual High School Charity Dance Showcase. This collaborative performance will feature the dance companies from Dobson, Mesa, Red Mountain, Skyline, and Westwood High Schools. Guest companies include Campo Verde, Desert Ridge, Gilbert, Highland, and Mesquite High Schools. Funds raised will be presented to the "I Will Not Bully" non-profit organization in the Valley. General admission. Tickets may be purchased online at http://www.mesaartscenter.com/index.php/shows/dance/elevateyourattitude or one-half hour prior to showtime at Mesa Arts Center. Price:$2 or entrance fee included in the cost of a BBQ meal purchase. Kick off of I Will Not Bully Inc's 'Words do Hurt!' Campaign, The 9-Creed Presentation & Pledge with an honorary appearance by teen advocate, model, and ambassador, Malloy Sells, 2014 Miss Teen Paradise Valley. • April 2, 2014 - Watch I Will Not Bully's Teen Ambassador, Malloy Sells, on Arizona Midday at 1 p.m. on Channel 12, Phoenix. • April 9, 2014 - Join I Will Not Bully Inc. for AZ Gives Day 2014 where the community participates in a statewide pledge day for 24-hours. Want to help our organization continue providing services? 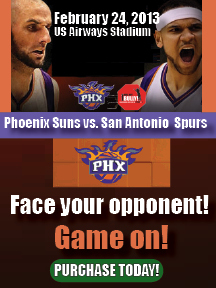 Schedule your donation today by visiting http://azgives.razoo.com/story/I-Will-Not-Bully . • April 9, 2014 - Bring your pledge and meet I Will Not Bully Inc. at Dunkin' Donuts located at 2131 E. Camelback Road , Phoenix , Arizona 85016, for our official AZ Gives Day 2014 kickoff. I Will Not Bully Inc. will be on-site handing out pledge cards, stickers and information about our organization. Bring the kiddos and enjoy delicious donuts while supporting our efforts on AZ Gives Day. Make a pledge!